Need help or a custom order? Thermal ribbon is an essential supply for many barcode printers. A thermal transfer printer uses the ribbon to melt a quick drying layer of wax, resin or a mixture of both onto a label to create a barcode. Finding the right ribbon to match the right label is vital because the wrong pairing can create a barcode that smears or fades, or might not produce any image at all. Tri-State Business Systems eliminates the guess work by assessing your business’s needs and supplying you with the ribbons and labels that best meet them. Even if already know what works for you, our competitive prices on barcode supplies, along with a 1% discount to clients paying within 30 days, can save you a bundle. No matter which printer you’re buying for, you can trust us to provide thermal ribbon that will meet of your needs. 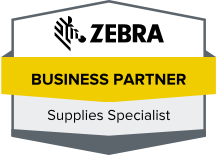 Whether it’s a wax Sony ribbon for a Datamax label or a resin Zebra printer ribbon for chemical resistant labels, Tri-State Business Systems carries many of the top-of-the-line barcode supplies on the market. We have one of the largest selections of equipment and supplies of any dealer nationwide, along with over 20 years of experience to help you make the right selections for your business. To find out more about our thermal ribbon, thermal printer labels, printers and services in Edison, Rutherford, Paramus, New Brunswick or nationwide, contact us today.